EDITOR’S NOTE: Updated Aug. 1 with Tory Bruno comments on Delta 4-Heavy. Riding a slow-moving over-the-road transporter, the spacecraft, its solid-fueled Star 48BV upper stage, and protective aerodynamic fairing departed the Astrotech spacecraft processing facility in Titusville, Florida, late Monday for an overnight journey to the Complex 37B launch pad at nearby Cape Canaveral Air Force Station. 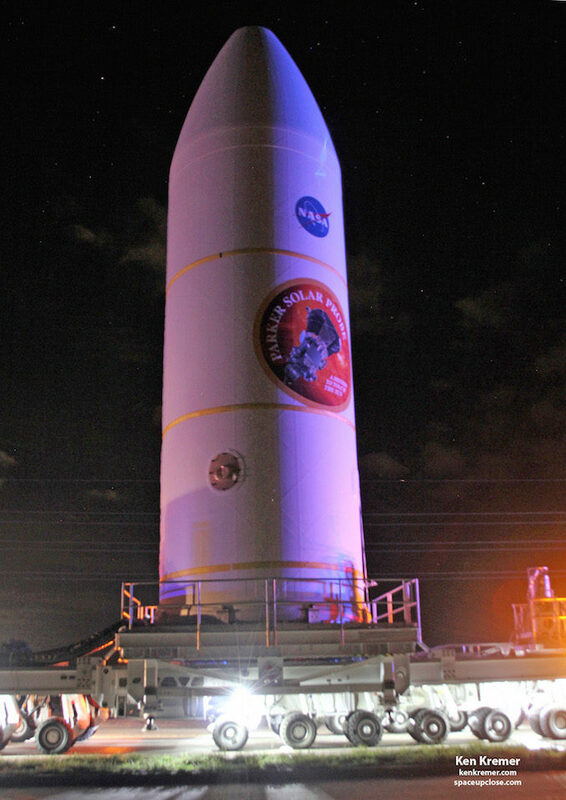 The convoy arrived at the launch pad before dawn Tuesday, and a heavy-lifting crane hooked to the 63-foot-tall (19-meter) fairing to hoist it atop a Delta 4-Heavy rocket, capping assembly of the launcher ahead of a predawn blastoff scheduled for Aug. 11. The 45-minute launch window Aug. 11 opens at 3:48 a.m. EDT (0748 GMT), kicking off a 43-minute flight across the Atlantic Ocean before deployment of the 1,424-pound (646-kilogram) Parker Solar Probe spacecraft from the Star 48BV upper stage. Named for Eugene Parker, who correctly predicted the existence of the solar wind in 1958, Parker Solar Probe will head for Venus after its Aug. 11 launch, using the planet’s gravity to slingshot into a tighter orbit around the sun. Assuming launch occurs Aug. 11, Parker Solar Probe will reach Venus on Oct. 2, then make its first close approach to the sun — or perihelion — on Nov. 5. During its first solar encounter later this year, Parker Solar Probe will reach a distance of roughly 15 million miles (24.1 million kilometers) from the sun’s surface, breaking a record set by the U.S.-German Helios 2 mission, which passed as close as 27 million miles (43.4 million kilometers) from the sun in April 1976. Six more Venus flybys will spiral Parker Solar Probe ever-closer to the sun, redirecting the craft’s trajectory toward its closest encounter with the sun at a distance of 3.83 million miles (6.16 million kilometers) in 2024, roughly 4 percent the distance of the sun from Earth. Parker Solar Probe will fly through the corona, a super-heated envelope of plasma surrounding the sun where temperatures soar to millions of degrees. The temperature at the surface of the sun is hundreds of times cooler, but still a blistering 10,000 degrees Fahrenheit (6,000 degrees Celsius). The corona is also thought by scientists to be the origin of the solar wind, a supersonic stream of charged particles flowing away from the sun in every direction, influencing the entire solar system and driving space weather. “How is the solar wind accelerated up to millions of mph very quickly in the solar corona? The work that Dr. Parker has laid out is the foundational work for understanding this process, and this is one of the primary goals of the Parker Solar Probe,” said Alex Young, associate director for science in the heliophysics division at NASA’s Goddard Space Flight Center in Maryland. Parker Solar Probe’s arrival at the launch pad is a key milestone in the $1.5 billion mission’s launch campaign. In the coming days, ground crews will ensure the spacecraft is correctly attached to the Delta 4-Heavy rocket. Launch rehearsals are also on tap over the next week-and-a-half, according to Andrew Driesman, Parker Solar Probe’s project manager at the Johns Hopkins University Applied Physics Laboratory. 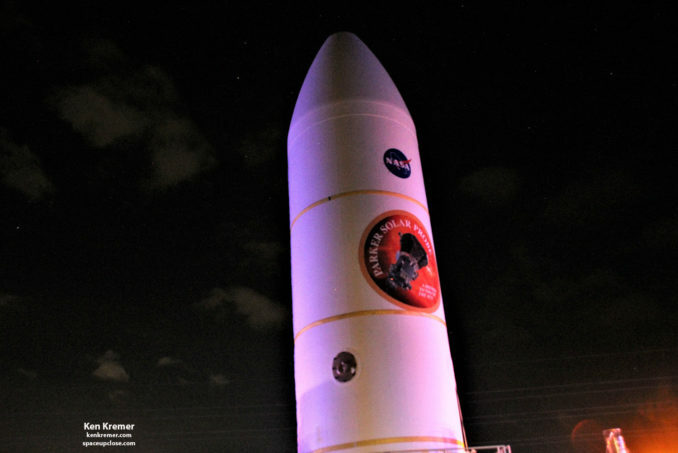 “Picture this 63-foot-high fairing on this vehicle moving through the Cape and part of Titusville,” Driesman said in an interview. “They arrive at the pad, hook it up to the crane, and lift this nearly 70-foot structure up to the top of the rocket, move it onto the top of the rocket, and then they bolt it on. Launch was originally scheduled for July 31, but software reviews and snags encountered during encapsulation of the spacecraft inside the Delta 4-Heavy’s payload fairing forced a delay. The mission’s launch period in August is governed by the positions of Earth and Venus in their orbits around the sun. Parker Solar Probe’s interplanetary launch period was supposed to close Aug. 19, but trajectory analyses suggest the mission could depart Earth through Aug. 23 and still meet its date with Venus in early October, giving managers an extra four launch opportunities after giving up the first 11 days of the interplanetary launch period. If further delays keep Parker Solar Probe on Earth after Aug. 23, the next chance to launch the mission will come in May 2019. But Driesman told Spaceflight Now he is confident the mission will get off the ground in August. 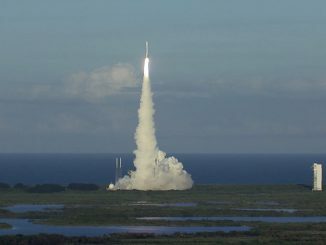 Parker Solar Probe’s launch campaign got into full swing in April, with the arrival of the spacecraft at the Florida launch base from the Johns Hopkins University Applied Physics Laboratory on April 3. The probe’s heat shield arrived a couple of weeks later, and ULA crews transferred the Delta 4-Heavy rocket to the launch pad April 16, followed the next day by the raising of the launcher vertical. Inside the clean room at Astrotech, technicians installed Parker Solar Probe’s power-generating solar arrays and heat shield over the past few months. The solar arrays have a custom design to withstand the blistering heat and sunlight the power generators will see near the sun, using a unique water cooling system to stay within temperature tolerances. 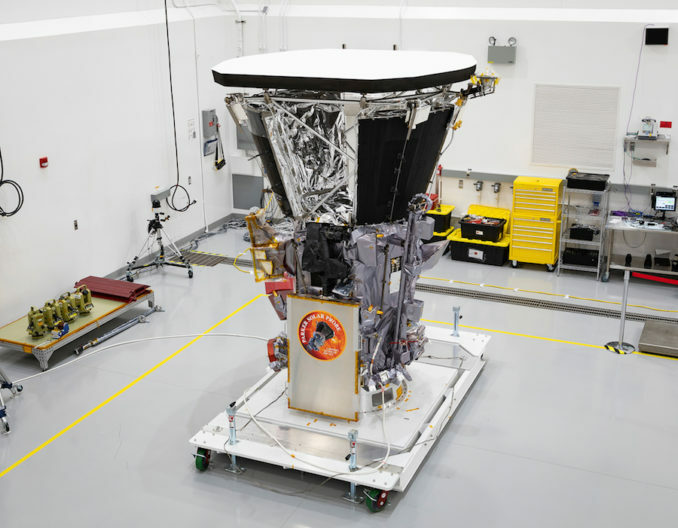 Workers also bolted on Parker Solar Probe’s heat shield, a 4.5-inch thick (11.4-centimeter) piece of carbon composite that stretches around 8 feet (nearly 2.5 meters) wide. The heat shield, or thermal protection system, will take the brunt of the heat during the probe’s close-up encounters with the sun, keeping most of the spacecraft — except for the solar arrays and a few scientific sensors — a bit above room temperature. The spacecraft carries autonomous control software to ensure temperature-sensitive components don’t get too hot, using inputs from temperature sensors to gauge where the probe should be pointed. Some of the sensors failed during testing, so engineers added a redundant set to the spacecraft, according to Fox. Parker Solar Probe’s team at Astrotech loaded around 176 pounds (80 kilograms) of hydrazine into the craft’s monopropellant propulsion system July 7. The probe will use the fuel and 12 tiny rocket thrusters to tweak its trajectory over its seven-year-plus mission, and help unload momentum from four spinning reaction wheels located inside the spacecraft’s main body, which will control the orbiter’s pointing. Once fueled, Parker Solar Probe was lifted on top of its Star 48BV rocket motor, which will act as a third stage during launch. Fitted with a vectoring nozzle, the solid-fueled kick stage was built by Northrop Grumman Innovation Systems, formerly known as Orbital ATK. The Star 48BV motor will fire for approximately 89 seconds after separation from the Delta 4-Heavy’s second stage, giving Parker Solar Probe an extra velocity boost. The Delta 4-Heavy’s triple-core first stage, powered by three RS-68A main engines producing 2.1 million pounds of thrust, will give the mission its initial lift, followed by two firings of an RL10 upper stage engine before the Star 48BV burn. 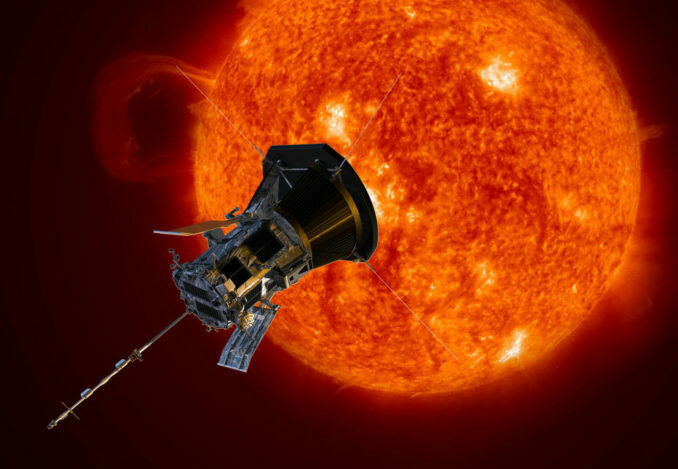 During its closest approaches in 2024 and 2025, Parker Solar Probe will experience 478 times the sunlight present at Earth, which orbits around 93 million miles (150 million kilometers) from the sun. The spacecraft’s velocity will jump to roughly 430,000 mph — 120 miles per second or nearly 700,000 kilometers per hour — during its final perihelion passages, setting a new mark for the fastest human-made object in history. SpaceX’s Falcon Heavy rocket can carry heavier cargo than the Delta 4-Heavy on most trajectories, but ULA chief executive Tory Bruno said the Delta 4-Heavy was the only launcher capable of meeting Parker Solar Probe’s requirements. NASA originally considered launching Parker Solar Probe on the most powerful version of ULA’s Atlas 5 rocket, but officials decided against the idea because it would have required the development of a bigger, custom-made upper stage motor. 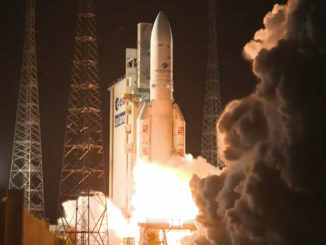 Variants of the Star 48 have flown numerous times, including giving an extra impulse of energy to NASA’s New Horizons mission to Pluto, which launched in 2006. The marriage of the lower-energy Star 48 motor with Parker Solar Probe meant the mission needed the “extra oomph” of the Delta 4-Heavy, according to Bruno. “Both Atlas and Delta uniquely possess high mass fraction, high Isp LOX/LH2 (highly efficient, liquid oxygen/liquid hydrogen) upper stages as foundations for a small 3rd kick stage, needed for a mission like this,” Bruno wrote. NASA also would not commit to launching a high-priority science probe on an unproven booster. At the time of NASA’s selection of the Delta 4-Heavy rocket for the Parker Solar Probe mission in early 2015, the Falcon Heavy was still three years from its first test flight. 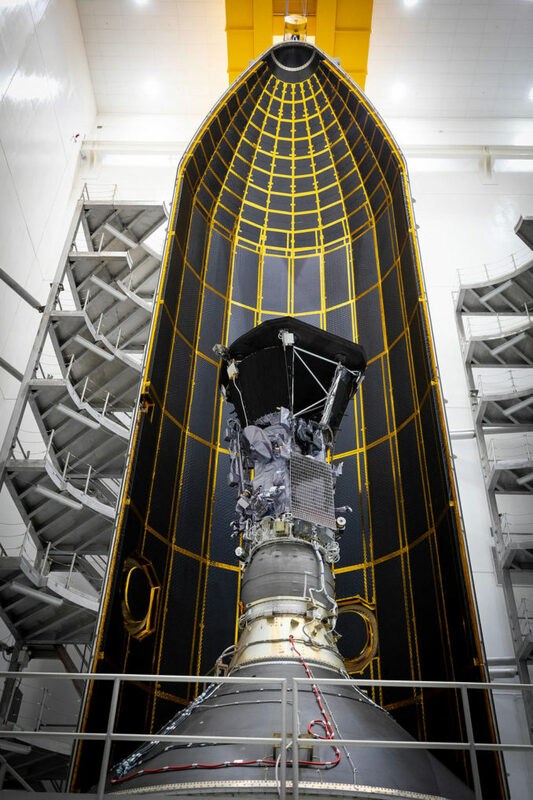 With the spacecraft now on its Delta 4-Heavy launcher, the ULA and Parker Solar Probe teams plan to conduct an integrated systems test, a checkout to verify proper electrical connections between the rocket and payload. Engineers also plan to condition Parker Solar Probe’s battery to maximize its lifetime, according to Driesman. 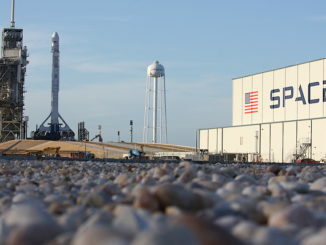 There are also practice runs for the launch team planned. ULA’s controllers already accomplished two countdown rehearsals in early July, during which they filled the Delta 4-Heavy with liquid hydrogen and liquid oxygen, then drained the cryogenic propellants from the rocket. Technicians will also enter the Delta 4-Heavy’s payload shroud to take off “remove-before-flight” covers protecting sensitive scientific instrumentation.